A Boheme Design architectural firm delivers modern living lifestyle to interact with the peacefulness & solitude of the famed Palmera Park. 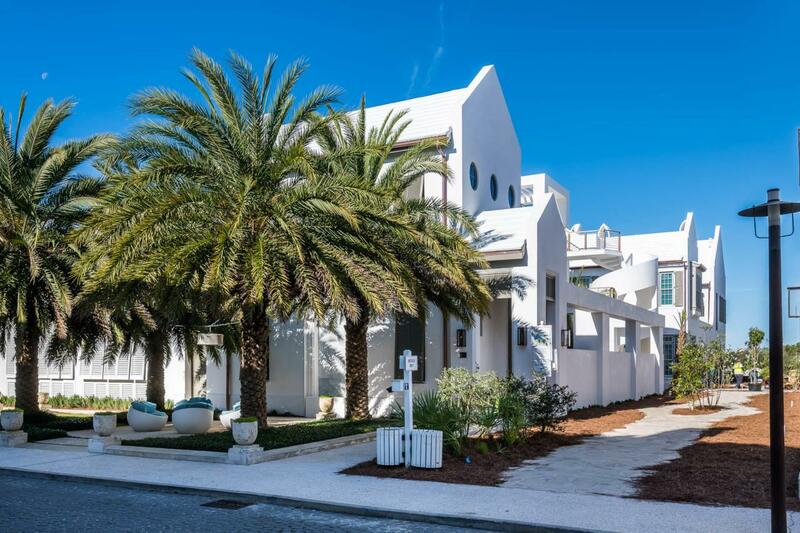 Located south of 30a, the serenity of the park setting further enhances the homes design and elegance. 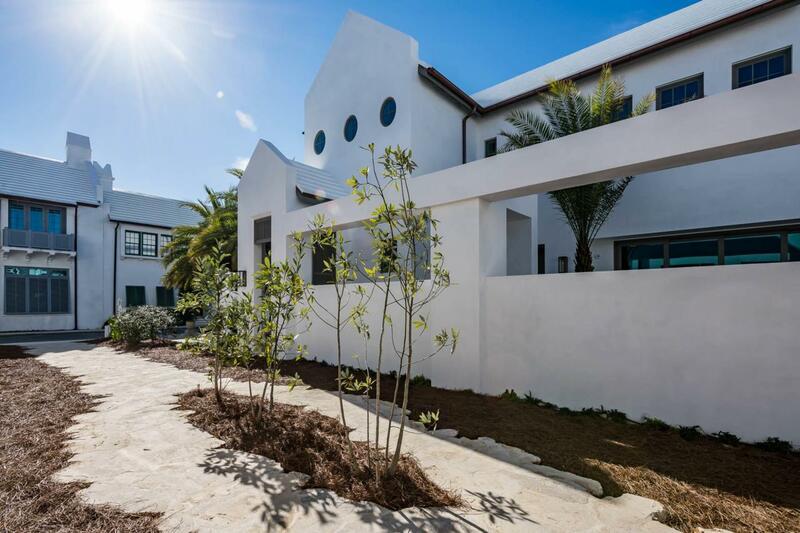 This stunning property is within close walking distance to the Gulf Green. Livability is not questioned with this property.62 S. Charles Street allows for full-time residency with the generous living aspects the home offers with its 3,845 square feet of conditioned living area and abundance of outdoor living. 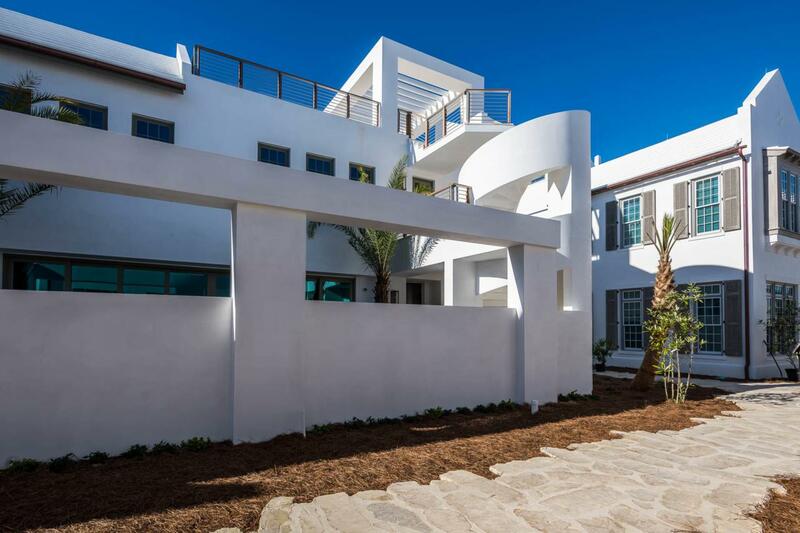 This 4 bedroom property consists of 2 master suites and 2 guest bedrooms, laundry rooms on each floor, a media room with beverage center, and captivating outdoor spaces. The kitchen, dining, and living rooms introduce the large courtyand pool with views through the 30' long multi-slide doors which open to create both spaces as one. The outdoor space is an architectural master piece showcasing the 32' water wall spilling into the length of the pool flanked by a gas fire pit. 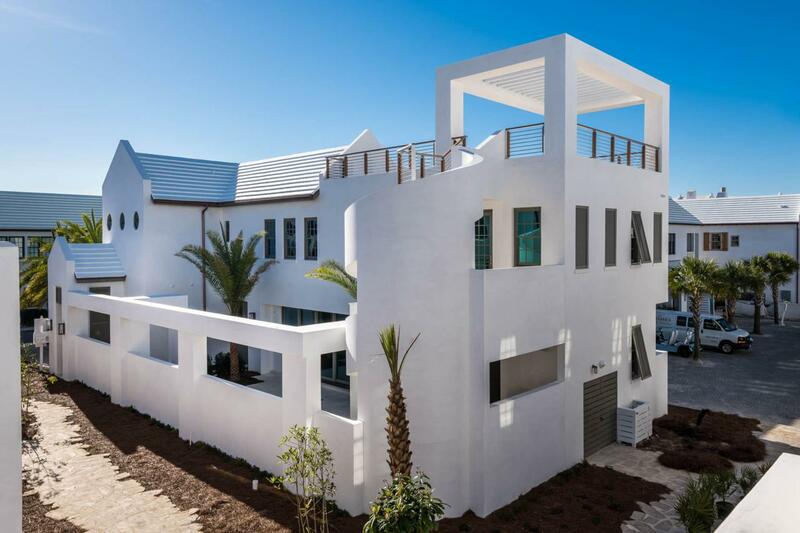 West of the pool is the covered summer kitchen featuring a Wolf grill and Sub-Zero icemaker & refrigerator shadowed by the masterful concrete spiraling staircase leading to the 3rd story roof terrace having Gulf views. Entertaining is limitless with the abundance of indoor & outdoor living. Each of the master suites orients to views overlooking Palmera Park. The 1st floor master suite hosts its own private court with outdoor soaking tub. Each of the master suites provides dual vanities, generous showers surrounded by floor to ceiling marble. Lacava plumbing fixtures for each. Both master suites accommodate walk in closets with large multi-slide doors that open to capture breezes and sounds of a still night. The 1st floor carries shell stone flooring throughout which continues to the courtyard. The 2nd floor transitions to Walnut creating a distinctive look while keeping the home's contemporary design. Saving the best for last is the magnificent kitchen appointed with a large island aligned to the courtyard views. This gourmet kitchen boasts a 48" Miele range, Sub-Zero refrigeration, icemaker, and wine cooler. The dining and living are congruent with the kitchen for entertaining. 12' ceilings carry throughout first floor allowing for the clad floor to ceiling marble surround of the fireplace. The Control 4 audio & visual system operates the home with ease & simplicity. The arrival to the 2nd floor is passed by a Zebra wood clad stair hall with an Italian-made polished stainless steel railing by Maretti. Upon arrival to the 2nd floor, you will immediately find the media room with a wet bar featuring the home's 3rd icemaker and beverage refrigerator. The 2nd floor hosts 2 very generous guest suites with beautifully appointed bathrooms and large closets. The private owners Beach Club now under construction east of this home along with the near completion of ZUMA Wellness Center. This home is a must see.